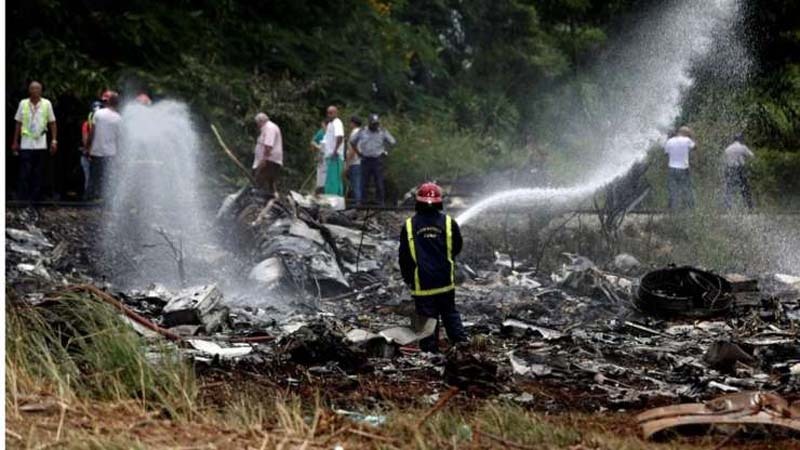 Two days of national mourning have begun in Cuba after a Boeing 737 airliner crashed near the main airport in Havana, killing more than 100 people. The plane, which was nearly 40 years old, was carrying 105 passengers and six crew members. Three women were pulled alive from the wreckage, but they are said to be in a critical condition. President Miguel Diaz-Canel said an investigation was under way. The crash is Cuba's worst air disaster in decades. Most of the passengers killed are believed to be Cubans, though reports say five foreigners and a six-strong Mexican crew were also on board. Argentina's government said two of its nationals - tourists Dora Beatriz Cifuentes and Oscar Hugo Almaras, both in their sixties - were among the dead. Relatives of the victims have started arriving in Havana to help identify the deceased. Those coming from Holguín - the plane's intended destination - and other eastern parts of the island made the 700km (435-mile) trip on buses. Cuba's National Revolutionary Police escorted them to speed their way, EFE news agency reports. Cuban authorities do not plan to release the full list of the 108 dead until all victims' families have been informed. It's too early to say what caused the crash, but eyewitnesses on the ground described seeing the jet burst into flames before crashing into a field close to a wooded area near the airport. Boeing said that it was ready to send a technical team to Cuba, "as permitted under US law and at the direction of the US National Transportation Safety Board and Cuban authorities". Four people initially survived the crash but one died after being transported to hospital, the director of Havana's Calixto Garcia hospital, Carlos Alberto Martinez, told Reuters. "She is alive but very burnt and swollen," one of the women's relatives at the hospital told Reuters. Two days of national mourning have begun, with the entire island sharing a little of the pain of the many families affected by the disaster. But in their grief, people also want answers. They are demanding an explanation as to why a routine flight from Havana came crashing down in a field barely a minute after it took off, with over 100 passengers and crew on board. The country's new president, Miguel Diaz-Canel, faces his first real test in providing those answers. He visited the crash site to thank the emergency services and announced an investigation was already under way. It emerged that the previous president, Raúl Castro, was recuperating from minor surgery on a hernia, and he too expressed his condolences to the victims' families. The families of the survivors face an anxious wait to see if they will pull through, and their countrymen are praying that at least some will have survived this catastrophe. The Mexican authorities said the plane was built in 1979 and had been successfully inspected last November. Mexico earlier said it was sending two civil aviation specialists to join the investigation. How does this compare to recent plane crashes? According to industry research, last year was the safest in history for commercial airline travel with no passenger jet crashes. But there have been several serious air disasters this year. Cuba's deadliest air crash was in 1989, when a Soviet-made Ilyushin-62M passenger plane crashed near Havana, killing 126 people on board and another 24 people on the ground.